Series. I have a love-hate relationship with them. They give you the chance to really become invested in a book, particularly fantasy books. I love that I can become engrossed in the world and go on a journey with characters, I get to see their development and I get to learn everything about a fantasy world, but there's a downside too. I have the WORST memory. If I'm going to read a series, I need to wait for all the books to be out so I can read them in fairly quick succession. This can obviously become quite annoying when everyone's talking about a book they love from a series and I'm sat hiding in a corner desperately trying to avoid spoilers. So overall, I think you need a mix of the two to have a balanced reading habit. However...I think I do slightly favour standalone's. Series can just be so intimidating, especially when they have 5+ books. I mean, how am I supposed to read all those books! Anyway, what do you think? 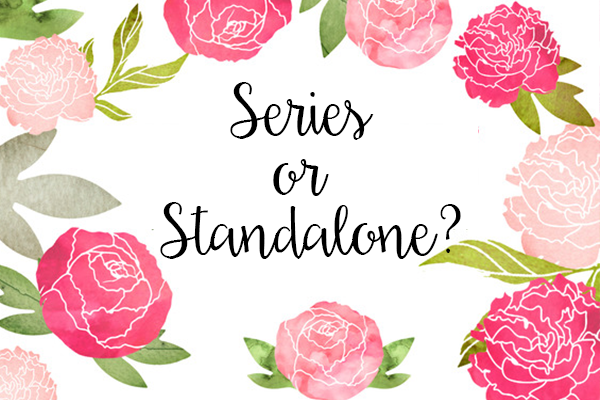 Do you prefer standalone's or series?